Mr Nosey is always poking his long nose into other people’s business. That’s what he does best. Curious young children will excitedly join Mr Nosey on his outing to discover what is going on in the houses around him. Who lives in the two houses with the small doors? Mr Nosey hates secrets. Something is hidden behind two large cupboard doors. What could it be? Nosey simply must find out. An introduction of opposites is discreetly created here. Mr Nosey isn’t satisfied. As he walks along the tree-lined road, he wants to know what is hiding in the trees. It doesn’t stop there. He simply must see what Mr Strong and Miss Greedy are eating for breakfast. Lift the flap to find out. The couch is his next hiding place. He wants to know what others are watching on TV. But all the Mr Men and Misses are wise to his tricks. They recognize the nose creeping past the window. Full of fun and surprises, this sturdy lift-the-flap board book is designed for frequent handling by small hands. The bold lines, vibrant colours, (Mr Nosey is bright green) and lovable characters are once again in action, with lots of additional surprises to be discovered on the pages. 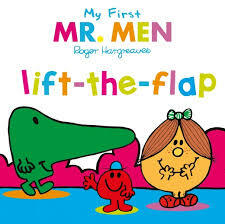 Check out the other My First Mr Men books for early learning that include Colours, ABC, Shapes, and Nursery Rhymes. New Mr Men books for a new generation.